David was apparently not a fan of Jeremy’s look, and he took to his keyboard to contribute some “talkin’ words” to the comments section. “Well ya look like a b*tch so there ya go,” David wrote. That didn’t sit well with Jeremy, and he came back at David hundredfold with a vitriolic tirade that contained no less than nine f-bombs. In between the profanity, Jeremy points out that David doesn’t come across as very intelligent, and also that he doesn’t have a job. 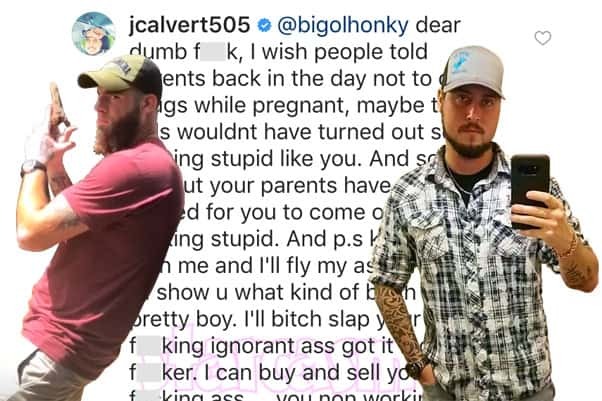 He proposes a couple theories about David’s conception before surprisingly referring to David as a “pretty boy.” Unfortunately, Jeremy concludes his rant by bringing up Jenelle’s lady bits. Jeremy would later respond to Jenelle’s infamous road rage incident in which she allegedly pulled a gun on a stranger with Jace in the car. That got an angry response from Jenelle, who went so far as to reference Jeremy’s girlfriend Desi, who had recently gotten two DUIs in the same night. That REALLY set Jeremy off! Jeremy also couldn’t resist commenting on the video of David Eason forcibly towing another man’s vehicle in downtown Wilmington.